The first question to ask when installing a paludarium is: what animals is it for? Turtle, newt, frog ? From this answer will arise different approaches to the paludarium. This guide will answer all your questions! A Paludarium is composed of a dry land area and an aquatic area. Thus, it will be between the terrarium and the aquarium. It should be noted that the aquatic part is generally more important than the terrestrial part. It is the ideal habitat for many freshwater turtles, newts and salamanders. Paludariums can thus make live fish, reptiles, invertebrates and amphibians. Beware, however, of predation between all these animals! Most animals kept in paludarium will enjoy a quiet place in the house. Do not put your installation in a place of passage, or regularly very agitated. In addition, avoid sources of cold or heat, such as near radiators for example. Similarly, too much exposure to the sun will favour temperature variations and the proliferation of algae. Also think about the practical side. The electrical installation must be available nearby, but far enough to avoid splashing water. For maintenance, your ecosystem must be accessible and convenient to clean. 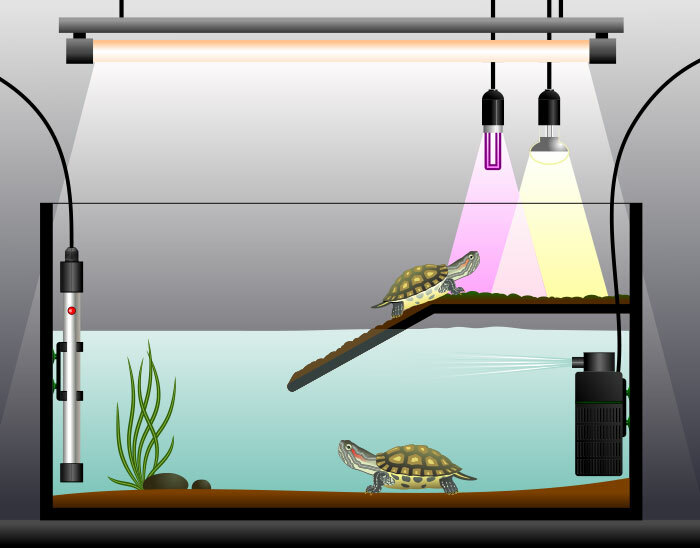 The installation of a turtle paludarium will require a tank with a frontage of at least 1 meter (3.2 ft) long, even if the turtle is small initially, because it will promote its good growth. For height, choose a tank that can hold about 30 cm (12 inch) of water, and another 20 cm (8 inch) for the dry part. Add another 20 cm (8 inch) so that the turtle does not tilt out of the paludarium when it is on the beach. It must therefore be at least 70 cm (28 inch) high. For land/water proportions, start with a ratio of between 25 and 50% of the emerged part (depending on the species of turtle, some are very aquatic, others semi-aquatic). An aquatic turtle needs to get out of the water completely regularly to fill up with heat. For this, you must provide a beach on which it can rest. This beach must be easily accessible from the water (access ramp) and allow the turtles to be placed under the heat lamps. This beach can be made of wood, stone... You can buy floating "turtle docks" that are kept in the aquarium by suction cups. If your platform is too heavy to fit in the paludarium, you can stick it to the walls of the tank with aquarium silicone sealant. You can complete the light installation with a timer that will ensure a 12-hour night-time cycle without your intervention. For the water, it must of course be heated and filtered. For filtration, do not hesitate to opt for a powerful filtration. Indeed, turtles are big polluters due to their size. Despite this powerful filtration, you will change the water from 10 to 15% of the total volume once a week! The temperature of the water must generally be between 24 and 26°C or 75 and 79°F, which implies the installation of an immersion heater (attention, learn about this last point depending on the species you plan to have. Indeed, the temperature requirements may vary from one species to another). Remember to cover your paludarium with a wire mesh for example. This protection will have to withstand heat. This is to protect your turtle: so it does not escape, and it will be protected from any broken glass if the bulbs break, or it will limit the risk of splashing on burning bulbs. Be careful, do not cover your paludarium with a sheet of glass because these materials filter UV and make your UVB lamp completely ineffective (in addition to the risk of breakage or melting). Finally, monitor your parameters using thermometers, both for the water temperature and for the temperature of the beach (which should generally be between 27 and 29°C or 80 and 85°F). You can also measure the ambient humidity using a hygrometer. For the decoration, install a substrat if you want to plant (sand is fine, but beware, turtles love to dig, or large gravel, more than 3 cm or 1 inch in diameter). You can add roots or rocks. Be careful though that the turtle can swim freely, and that there is no risk that it stays stuck in a corner. 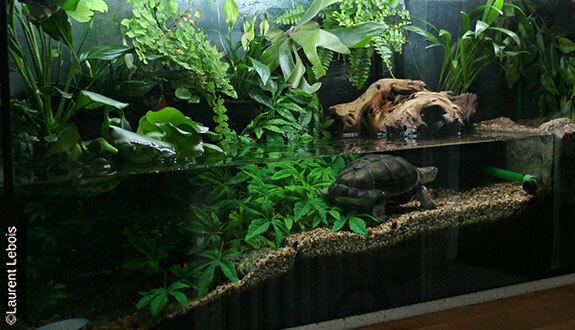 Trick: you can grow your plants in a small aquarium separately and use the new feet, cuttings or new surface plants in the turtle’s paludarium!). Depending on the size of the frogs / toads sought and their number, it will adjust the size of the paludarium. A good general base is a tank 50 cm (20 inch) long, for 30 cm (12 inch) wide and 30 cm (12 inch) high.. Your paludarium should have a mesh lid to ensure good ventilation and avoid bacteria and mold. Another part of the paludarium will also have to be screened to allow the circulation of the air, while keeping a good hygrometry. It is quite difficult to generalise the proportion of land/water needed by frogs as this can vary from one species to another. Dendrobates, for example, require very little water and a simple cup will do the trick, unlike Dyscophus guineti which must have a large shallow pond. You will need to find out what species you are considering (see the species sheets in the animal section). Most frog species will require a warm and moistenvironment. For heating, equip your paludarium with a carpet or heating cord coupled to a thermostat. Thus, you will always have the desired temperature inside your Paludarium (control the temperature anyway with a thermometer if the thermostat does not indicate it to you). To maintain sufficient moisture in the terrarium, you can set up an automatic misting system. If your budget is limited, you can maintain this humidity yourself by spraying water twice a day. This solution, although more economical, is also quite restrictive, especially if you are absent. Regularly check the humidity with a hygrometer. For lightning, choose a system that will not overheat as this will cause the rapid evaporation of moisture (such as spots for example). The lightning can therefore be any neon, horticultural bulb, LED ramp, or economic bulbs that will respect this constraint related to the heat released. For heating, humidity and lightning settings, there are no generalities as it will have to meet the specific needs of the species being kept (look the species sheets in the "animals" section). The most common plants used in frog paludarium are ficus benjamina and pumilla, bromeliads, epiphytes, scindapsus and mosses. Its natural plants will help to increase and stabilise the hygrometry, so do not deprive yourself! 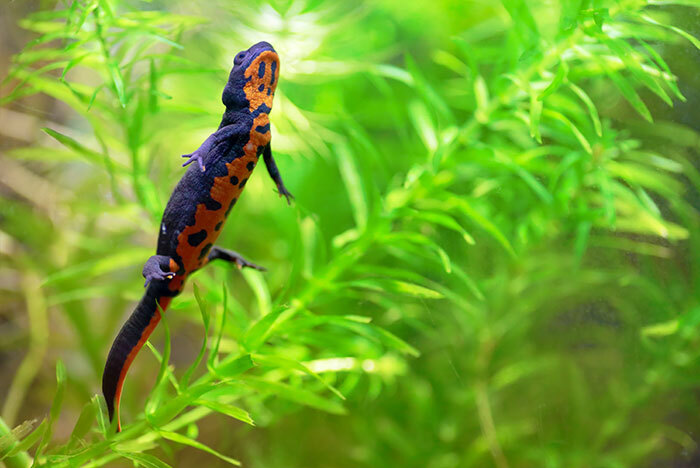 Many species of newts and salamanders are protected and therefore prohibited from sale or from harvesting from the wild. We will mention here only the species whose detention is legal. 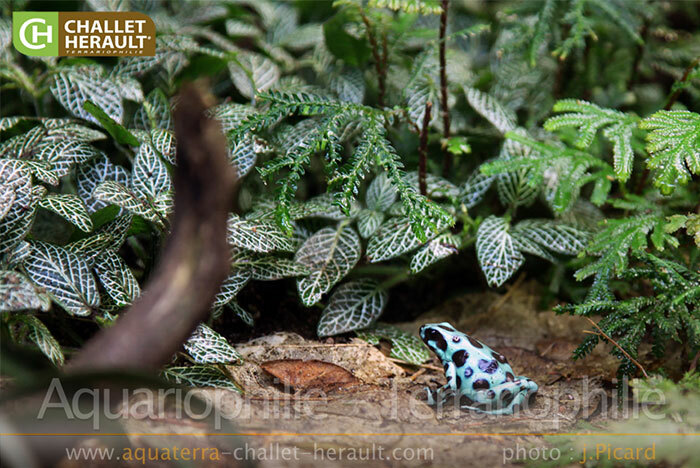 It is difficult to make a good choice of paludarium for the Tritons and Salamanders, because it will really depend on the species, and sometimes even the period of life of the animal! For example, the Axolotl (Ambystoma mexicanum), famous representative of the family of Salamanders, can live entirely in aquarium or paludarium if they metamorphose (which is certainly quite rare). Thus, some animals will live in aquarium, others in paludarium. So you must first learn about the way of life of newts or salamanders that you plan to maintain. For most species (except those living exclusively in aquariums), the emerged bank will consist of compost. Trick: the heather earth is acidic and prevents the formation of mold, however, the growth of plants can be tricky. It consists of installing a classic potting soil and then covering it with a layer of heather earth. Install a good layer of foam over it by creating hiding places. You can also add some plants, dead leaves or pieces of bark. These animals like humid and rather cold places (between 15 and 20°C (60 to 70°F)). To maintain a good humidity level, set up an automatic misting system, or do manual sprays.. Be careful, the substrate should not be soggy. Trick: o prevent your soil of being soggy, install a drain at the bottom of the tank. A simple layer of 3 cm (1 inch) of gravel, pozzolan, or expanded clay balls will work. Pay attention to lightning, which is not essential. If you have one, for example plants, it should not release too much heat as newts and salamanders are afraid of heat.